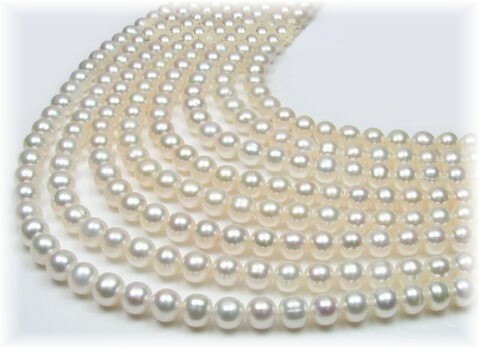 Almost perfect, natural, white round 6-7mm freshwater pearls in a dramatic seven row formation. Very sophisticated and glamorous and inspired by the 1920s and the heyday of Hollywood, when stars from the big movie studios, such as Audrey Hepburn, Marilyn Monroe and Grace Kelly added pearls to their favourite outfits to add that all-important little dash of pizzazz! Romantic. Elegant. Superlative. Shortest length: 39.4cm (15½").